When I was a teenager, I was fortunate enough to live through what was inarguably one of the greatest eras in video gaming. The early 1980’s was the epoch in which the video arcade was born, as well as the very beginning of console and PC games. In the pecking order of the day, the most exciting gaming experience was had standing (or sitting) in front of a coin-operated cabinet, while at home we were left to lament at how disappointing the computer versions of the arcade games actually were. There were also some games released for the home computers of the day (which were generally built by Apple, Atari, or Commodore) which bore a striking resemblance to arcade favorites, but were just different enough to (hopefully) avoid legal action. 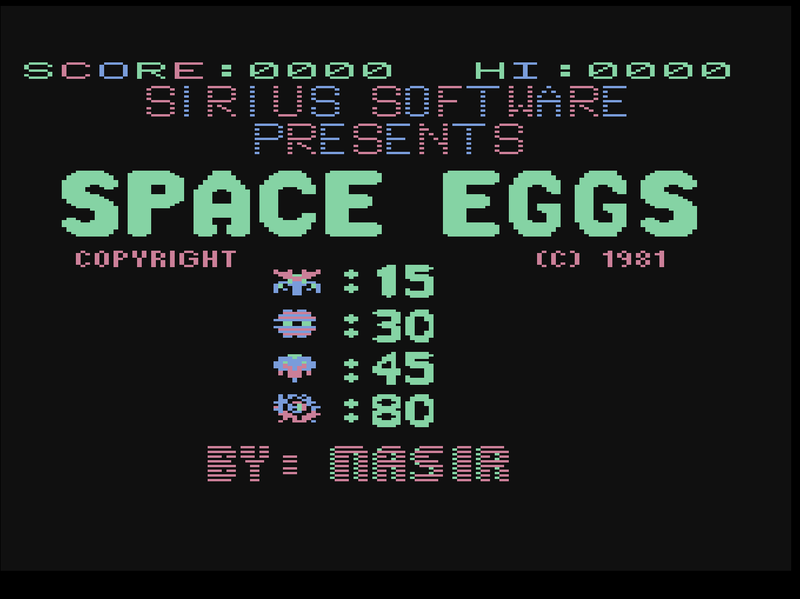 The opening screen of Space Eggs (Atari version). One of these became very important to me. Space Eggs was a riff on a Space Invaders variant called Moon Cresta. There were a couple of twists on the theme which I found fascinating. The first, and most obvious was that the player’s ship came in three parts, arranged like a pyramid. The first ship (or first stage) was the smallest, and fired a single shot from the center. This was a pretty standard Space Invaders-type ship. The first ship parked on top of the second, which was a bit wider, and fired two projectiles at a time. The second, in turn, sat on top of the even wider third stage, which also had two cannons located at its edges. 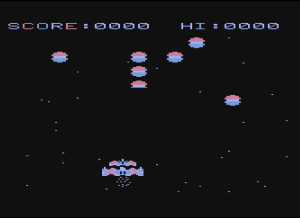 If the player was sufficiently skilled to earn extra ships, and played things just right, it was possible to dock one or more stages together, and get the combined firepower of each stage. That was pretty cool. The alien opponents started out as harmless puffballs which wiggled around in strange patterns (not in a regimented, predictable plod like Space Invaders), and once struck by a missile, they would dive-bomb the player, making erractic, seemingly random dodges and weaves as they charged the player, thirsty for digital blood. I first saw Space Eggs played on an Apple II at the height of its reign as the home computing platform of choice. The Apple was beyond my reach at the time, but I was lucky enough to have an Atari 800, with which I was quite happy. 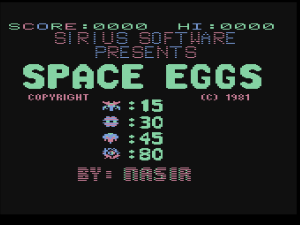 As much as I loved (and still love) the 8-bit Atari platform, I had to admit that I was a little jealous that there was no Atari version of Space Eggs. That changed one fine day when Sirius released the long-awaited (at least be me) Atari port. Superficially, the game looked a lot like the Apple version, but I thought the colors looked a little bit better in Atari’s palette. With the particular single-mindedness that is exclusive to young teenagers, I saved up all my money until I could get my little mitts on that 5.25 inch floppy disc, containing 90 kilobytes of gaming Nirvana. I spent the next several weeks having an absolute blast shooting alien monsters, and discovering that, aside from the colors, there was another major difference between the Apple and Atari versions: The Atari version was both significantly more difficult, and also much more low-scoring than its Apple counterpart. 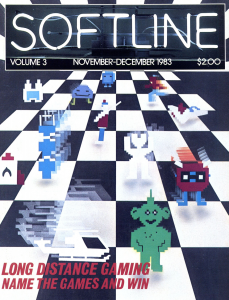 This was verified when I checked out the high score column in the back of Softline Magazine, which was, at the time, the major source of scoring records for most computer games. The high score recorded for the Atari version was just above two thousand points, while the Apple score was just over seventy-five thousand! This seemed to be way beyond the point where one might assume that the score gap was due to a smaller player base, or a generally lower level of gaming competence among Atari vs. Apple players. For me, the net result was that I saw an opportunity. The submission rules for Softline were fairly simple: include a photograph of the screen along with information about what platform and settings were used. If you wanted to get an extra level of confirmation, include a signed statement from a witness who saw you achieve the score, and you’d get an asterisk placed next to your entry in the high scores column (one of those cases where an asterisk is a GOOD thing). Close up of my Space Eggs score as recorded in 1983. Something of a battle had started heating up. The score had gone from 2,045 to 2,530 in one month, and then 4,045 the next. The score I submitted: 4,740, complete with signed statement from a cooperative witness, got my name printed, along with the the coveted asterisk. 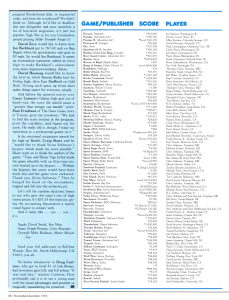 I was famous, and a world record holder! 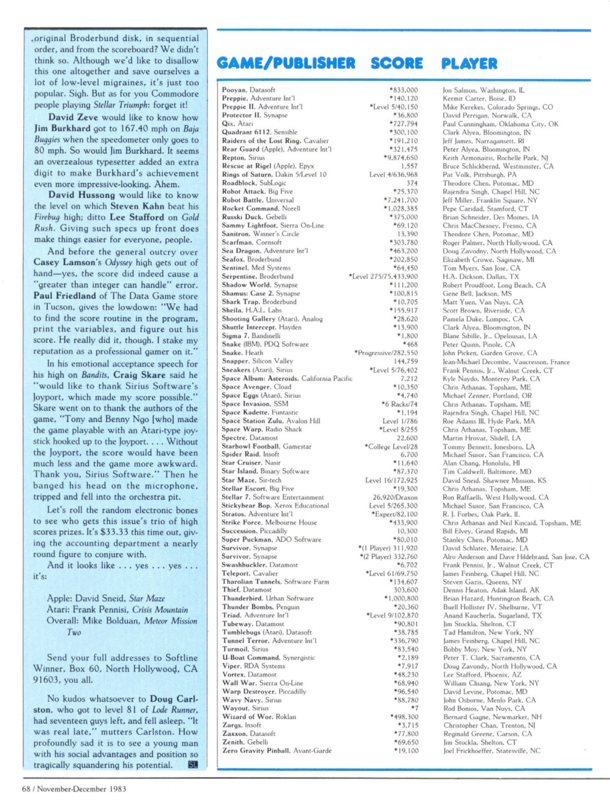 I wasn’t really expecting to hold the record for long, but there were no successful challenges for the rest of the history of Softline magazine, and in fact, the very last issue (which was only two more, the last of which heralded a bizarre name change to St. Game), still contained my score. I wasn’t a kid who played organized sports, so for me, this was pretty much my version of saving a newspaper clipping as a momento of a touchdown pass or a key strikeout in the “Big Game”. I also didn’t really think about it much over the next three decades. 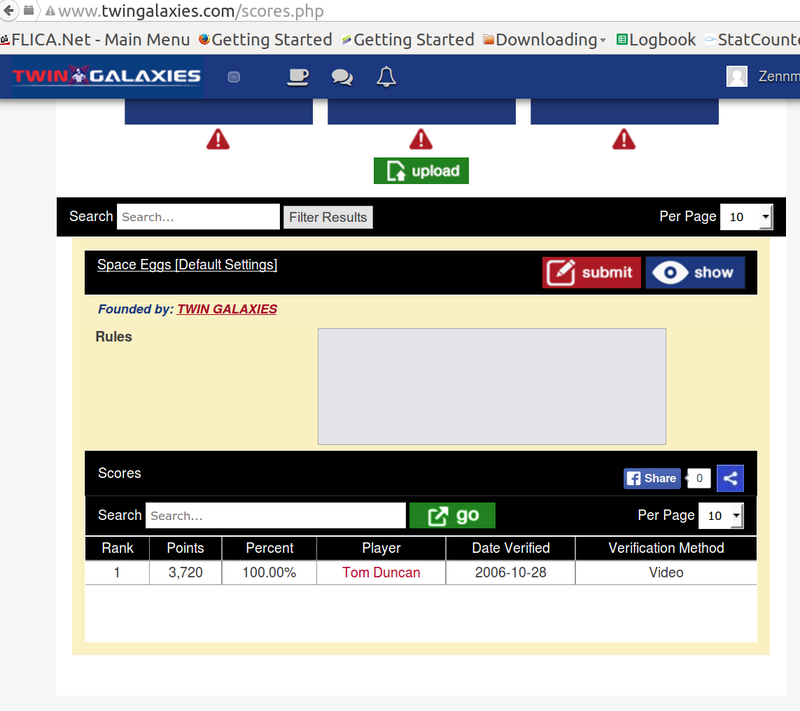 Twin Galaxies’ current high score for the Atari version of Space Eggs: 1,020 points lower than my score! Last year I saw King of Kong for the first time, and became aware of the Twin Galaxies website. If you’re not familiar, Twin Galaxies has been the most famous scoreboard for current as well as retrogaming since the early 1980’s. On a lark, I decided to check and see if there was a score submitted for the Atari version of Space Eggs. The high score recorded by the illustrious Twin Galaxies video game score database was 3,720, a full one thousand points lower than the score I had recorded all those years ago! So what is a gamer nerd to do? Well, the obvious thing to do is to buckle down, repeat the accomplishment, and submit it to Twin Galaxies! How exactly do I get to where I can play the Atari version of Space Eggs again? I think I still have an Atari computer somewhere, probably in storage. Does it work? That’s a very good question. I’ll check out out, and if I can’t find it, or it doesn’t power-on, it’s off to Ebay or Amazon. There are still some old Atari computers floating around. On the other hand, I know that I do not have an Atari floppy disk drive, which is a problem, since Space Eggs was distributed on floppy. I’m also pretty sure that I still have the original disk, but I can only imagine what a 30 year old floppy would do if inserted into a 30 year old disk drive. I suspect there would be a large puff of odd-colored dust gently drifting to the floor as the disk disintegrates. Okay, what else we got? An emulator??? Twin Galaxies is very strict on the use of emulators, which means “no dice” for the use of one on this project. To be recognized as an official record, a score must be obtained on the original hardware. There are certain exceptions for Arcade-based games, but even then they are in their own category. In our case, it’s the original hardware or nothing. Of course, this does not preclude the use of an emulator for practice and training purposes. (I use Atari800, which is an open source emulator that runs nicely under Linux). The problem remains, though, of how to get the game, and then how to load it onto the computer? There is good news. A gentleman by the name of Przemyslaw Krawczyk, who operates out of Poland, manufactures a small device called the SIO2SD. This cool little gadget does something pretty amazing. It allows an Atari computer (which uses a bus called SIO) to use an everyday SD card (like you’d use in a digital camera) as a storage device. At the time of this writing, I’m not sure where I would be able to even find an SD card that was smaller than 4GB. To put this in perspective, the Atari computers used floppy disks that held 90 kilobytes of data. What this means is that if one were able to find every single piece of software ever developed for the Atari, it would fit on a single card that you can get at Staples for under five dollars. The cost of the SIO2SD seemed like a very reasonable investment, and so I ordered one. The shipping confirmation arrived via email today, with an arrival estimate of 7 to 45 days. Looks like I’ll have some time to practice! Well, I’m not going to say where I found it, but I did. I highly suspect that the game is now “Abandonware”, as it was released in 1981 on a platform that has been obsolete for so long that the very last machine to come off the assembly line is old enough to buy beer in all fifty of the United States. Even so, I do own a legitimate copy of the gam, and if the current copyright holder really wants to take me to task over this issue, I am more than happy to discuss a settlement. Now, there’s little to do but wait, and, of course, practice! I do have to wonder though why they wouldn’t honor the high score you received, and had verified, back in the day? 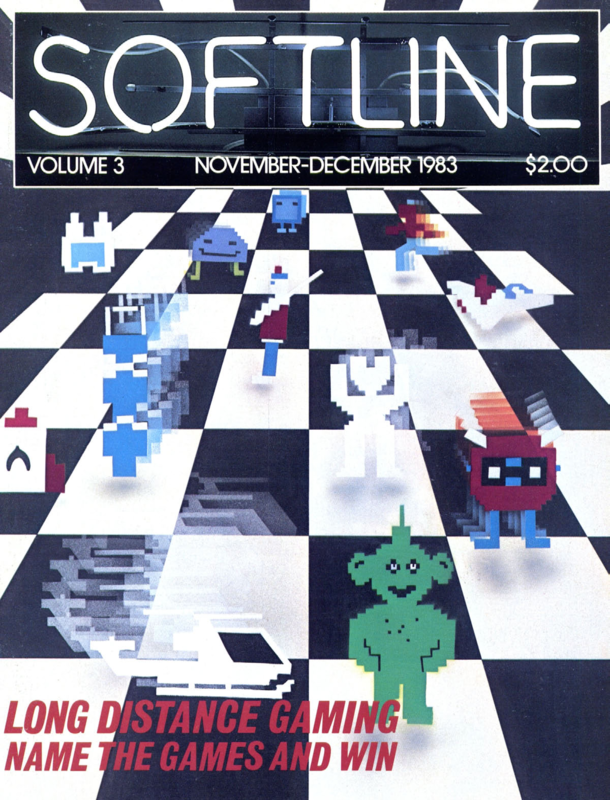 The short version is that Twin Galaxies has no control over or access to the process that got my score published in Softline. Additionally, the photographic verification/witness statement, which was the standard at the time, does not meet the current criteria for inclusion, even if I did still have the photograph. Also, this is way more fun!